PowerPoint is a powerful tool to create presentations. However, when used as a platform for imparting digital learning, it falls short because of many factors. The inability to develop interactive modules is a major limitation PowerPoint faces. The level of interactivity that can be achieved in a PowerPoint e-learning course is restricted to just click-and-reveal. Even developing this can be time consuming, costlier and can start to get messy after a few slides. Integrating assessment and feedback in PowerPoint can also prove to be an inefficient task. As PPTs won’t be linked to a centralized data through an LMS, analyzing feedback and test results won’t be easy, and can prevent you from getting useful insights about the effectiveness of the course. PowerPoint presentations often follow a very linear flow of content. This might hamper training programs that involve extensive topics, as in these cases navigation is preferred without any restrictions. Even after all these drawbacks, if you choose to use PowerPoint to impart training to your employees, it will be like fitting a square peg in a round hole. When you begin your conversion, keep in mind that you don’t have to stick to the existing layout of the content. A course can be made more interactive and engaging by merely reorganizing the flow and layout of the content. You can even speed up the entire process by using inbuilt page layout templates available in authoring tools. Say if the PowerPoint presentation is using only bullet points to grab learner’s attention, then you can change the layout and use attractive graphics to make the course more exciting. 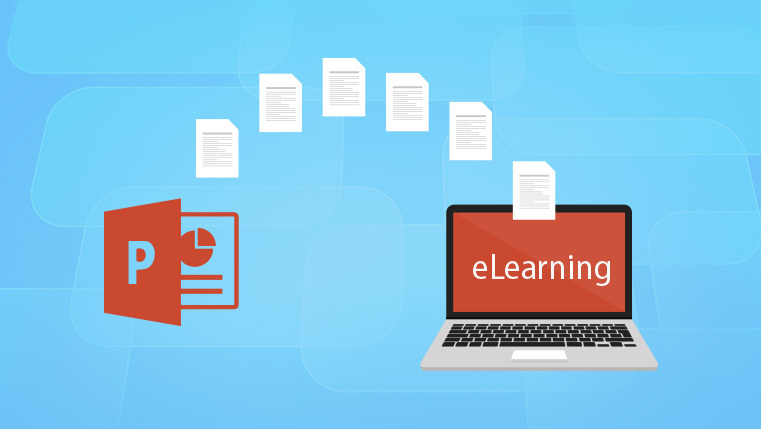 There are many e-learning authoring tools that can help professionals transform presentations into dynamic e-learning courses. Each tool will have its own strengths and weaknesses. Some might offer really easy conversion options, but will lack in providing tools for advanced customization. There are tools that are optimal for converting text-heavy presentations, while some tools can create courses that are rich in multimedia elements. So before picking up the right tool, a thorough analysis of source material and the expected output should be made. This way, you can fully utilize the strengths of the tool and not worry about its drawbacks. Check out this eBook to select the best authoring tool for your needs. One way you can break the rigidity of a PowerPoint presentation is by adding a navigation menu at the beginning of the course. By allowing users to quickly access a module of their choice, it can introduce a new bout of interactivity in the course. If the course content is too bulky, it can be broken down into smaller, easily absorbable sections. Include game-based content, video elements, audio voiceovers and interactive assessment methods in your converted PPT course. These elements add a new visual value to your course, boosting user engagement. By adding these features you can breathe a new life in your otherwise dated PPT content. Use these rich multimedia elements to convert your one dimensional PPT into a vibrant and captivating e-learning course. Utilize these few tips and you can make the most of the knowledge in the PowerPoint slides that you have worked so hard to produce. Use this powerful tool for what it is meant to do and don’t force fit it in the e-learning sphere. Only use dedicated e-learning tools to give your employees the best possible experience.